The US Capitol Building is seen after sunset in Washington, DC. WASHINGTON — President Donald Trump warned Wednesday that a government shutdown was possible this weekend because Democrats were demanding to have ‘‘illegal immigrants pouring into our country,’’ tossing incendiary rhetoric onto a partisan showdown that had been showing signs of easing. Trump’s comments risked roiling a White House meeting with congressional leaders of both parties planned for Thursday aimed at averting a shutdown and sorting through year-end disputes over the budget, immigration and other issues. 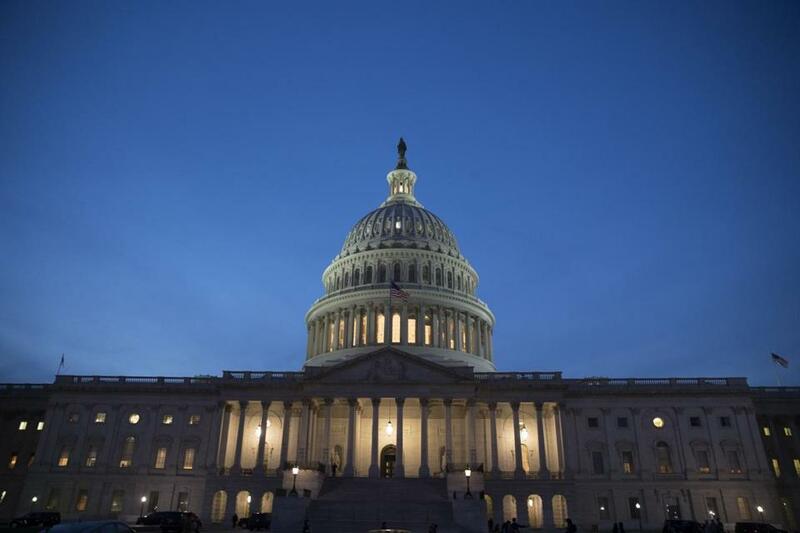 With money for federal agencies running out at midnight Friday, Republican leaders plan to push a bill through Congress this week financing the government through Dec. 22. That would give bargainers time to work through their disagreements, but they will need Democratic votes to succeed. Democrats have been using their leverage to insist on spending boosts for health care, infrastructure and other domestic programs that would match increases Republicans want for defense. Democrats are also seeking an agreement to extend protections for hundreds of thousands of immigrants who arrived in the U.S. illegally as children. Trump ended safeguards against deportation three months ago but has expressed an openness to restoring them. It was unclear what Trump was referring to. Democrats have opposed his plan to build a wall along the border with Mexico, but have expressed a willingness to fund other border security measures. Democrats have also opposed Trump’s effort to stop letting legal immigrants apply to bring their relatives to the U.S.
Trump also referenced his bar on travel into the U.S. from six Muslim nations, saying, ‘‘We don’t want to have radical Islamic terrorism in this country.’’ While Democrats have opposed that ban, the issue hasn’t appeared to be part of the budget talks. Earlier Wednesday, hard-right House conservatives signaled an openness to a short-term spending bill this week. Meadows said his group had not taken a final position on whether it will back the short-term bill, but he and several other conservatives stopped short of saying they would oppose it. Later, he and conservative leader Rep. Jim Jordan, R-Ohio, met with top House Republicans and said they were seeking a strategy to reduce Democrats’ budget leverage by quickly approving a full-year budget for the military. It was unclear how Republicans could prevent Senate Democrats from blocking such a move. The roughly 30-member caucus has been trying to win promises of tight budget curbs and other concessions from leaders in exchange for backing the short-term bill. Without support from many of them, Republicans would need votes from Democrats to push the temporary spending measure through the House, and Democrats have not said what they will do. Top Republicans are adamant about not sparking a federal shutdown that would deal the latest blow to a party that has strained all year to show it can govern effectively. They want voters riveted on the party’s nearly $1.5 trillion tax bill, the paramount priority for them and Trump. Democratic votes for any budget measure will be crucial in the Senate, where Republicans by themselves lack the 60 votes needed to approve the legislation. Besides temporarily financing the government, Senate Majority Leader Mitch McConnell, R-Ky., said the short-term measure would make cash available to several states that are running out of money for the Children’s Health Insurance Program. That widely popular program helps provide medical care to more than 8 million children.